Handcrafted from Terracota Genuine Leather.The handbag has 1 main compartment/s. 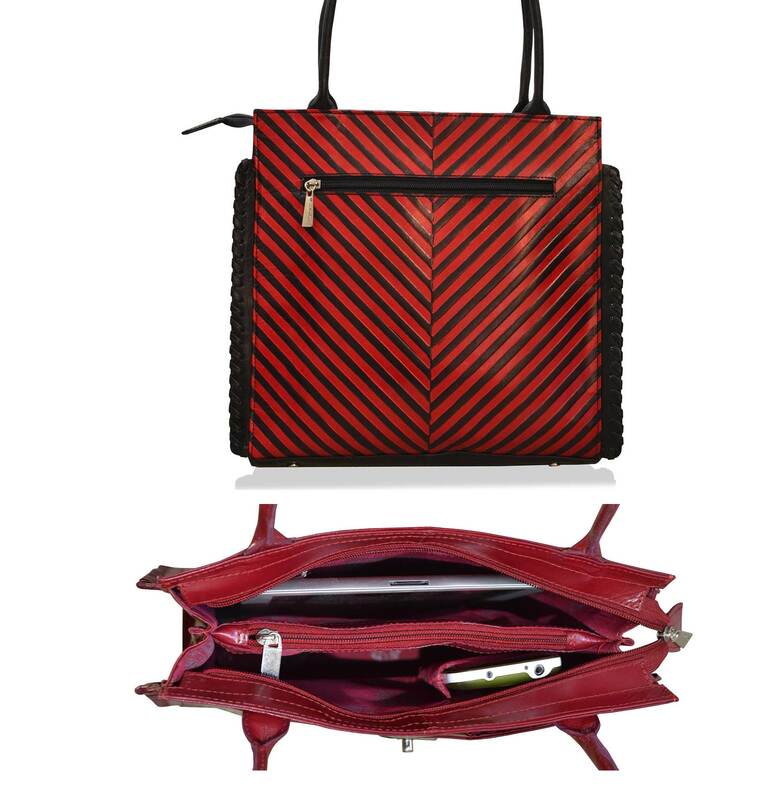 Top mouth closes by a zipper.The lining consists of 1 main Compartment/s.Also included is a back wall lining zipper compartment.Slip compartment for mobile.Front Slip in Compartment closes by button.Back Slip-in compartment closes by zipper.Terracotta leathers are arpera’s vegetable tanned leathers that are designer embossed. It is 100% full grain leather . Polishing effects give the leather a slightly stiff yet glamorous shine. Hand paintings ,tone effects add to the richness and colour depth of the leather. This leather is a labour of love and craftsmanship unlike conventional leathers that are machine processed. Dimensions:Dimensions in inches : L <-->12.5 x Height 11 x Depth 4. 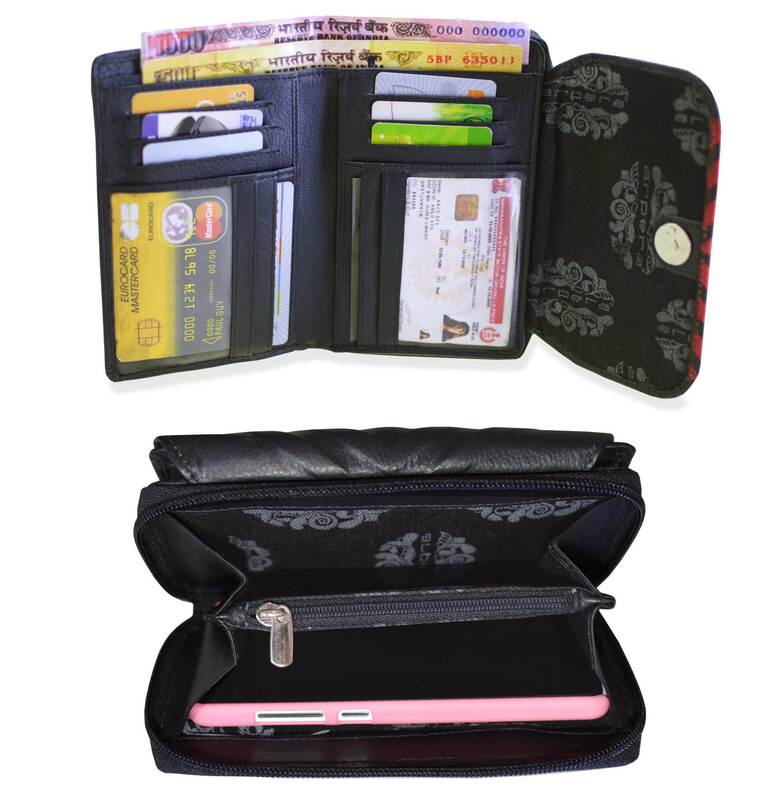 Shoulder handle drop length :8"
This wallet for women keeps you completely organised.Ideal sized,put your phone,keys,cards,cash,knick knacks all organised compactly.Will accommodate phones upto 5.75" and smaller in the zipper compartment.Hand-crafted from Nappa Genuine soft Leather.8 credit card slots provide ample room for all your important cards.The ladies purse has 2 transparent I.D. Card windows.Organize your Currency in the 2 note compartments.1 Chain Compartments for knick knacks.1 coin compartment for coins. Secure Closure by a zipper. Dimensions when closed ( inches) : L 4" x B 6" x Depth 1".When opened (inches) : L 4" x B 11.5" x Depth 1"